Korean food always had a special place in my heart tummy. 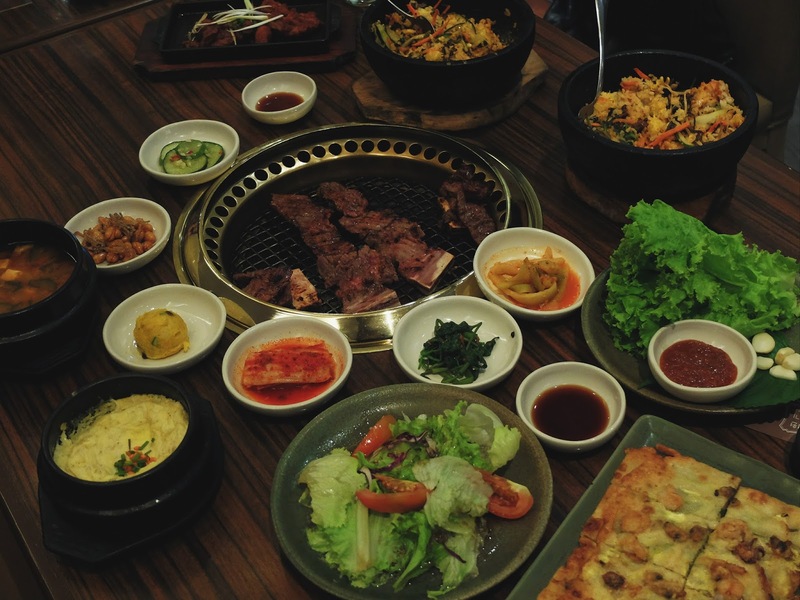 In fact, even before I got into the whole K-pop and K-drama scene, their wonderful cuisine already got me enticed. I've worked in this big Korean electronics manufacturing company in Calamba before and was exposed to authentic Korean food because of this little hole-in-the-wall called Suwon Galbi. I was the biggest fan or their budae jjigae (we call it military soup) and pajeon! That's where all this love story started. I'm always on the hunt for great Korean restaurants here in the metro. 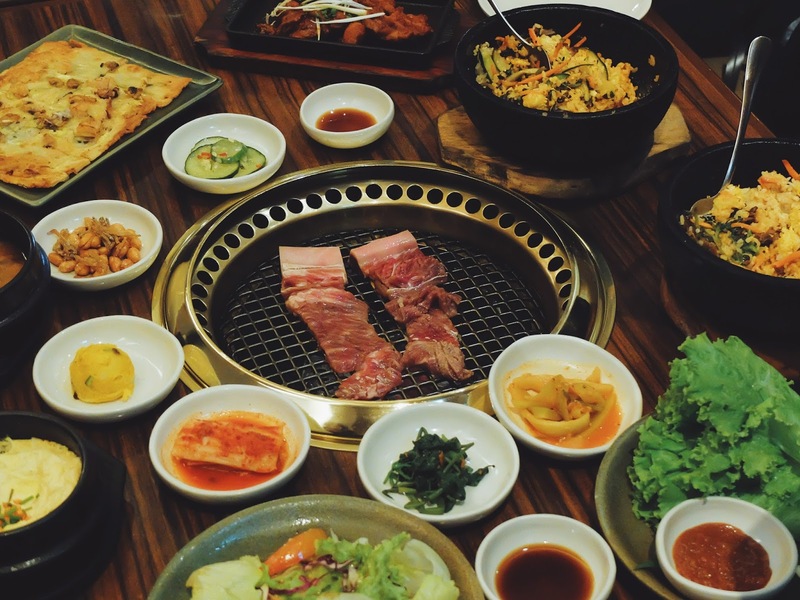 If there's a new Korean place worth visiting, I'm there! 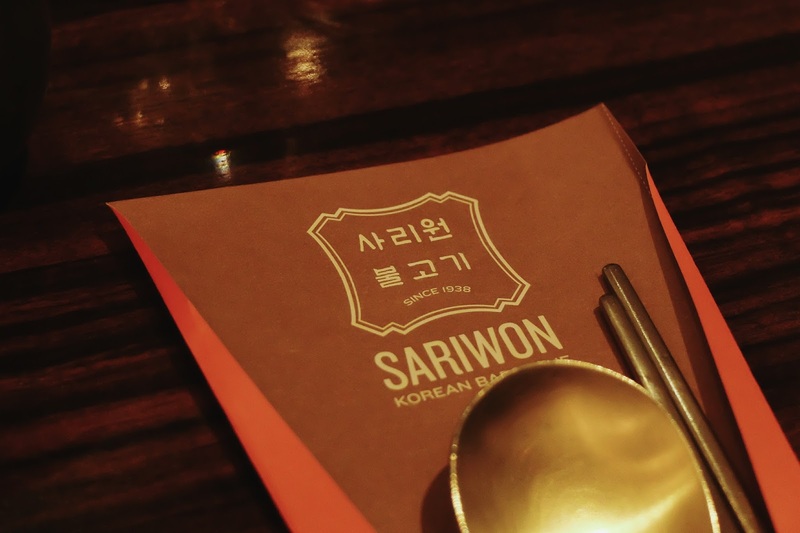 And actually, this is not the first time I've eaten at Sariwon, I've been to their Taguig branch a few times a couple of years back. So when I got an invite from Zomato for a foodie meet-up here, you bet I'm there to try again their great food! Wang Galbi. 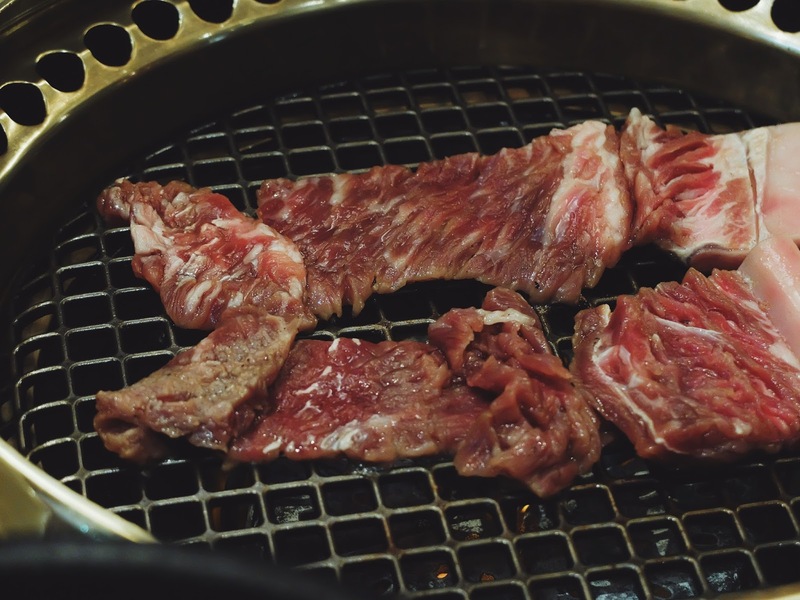 Their best-selling wang galbi (wang is "king" in Korean; wang galbi means king ribs) is very tender and juicy. It's marinated with special fruits and vegetables, giving it a unique tasty flavor. This galbi was really, really good. No sauces needed at all. It was a mouthful of soft texture and succulent, flavorful goodness with every bite. Their selection of refillable banchan. Dak Galbi. 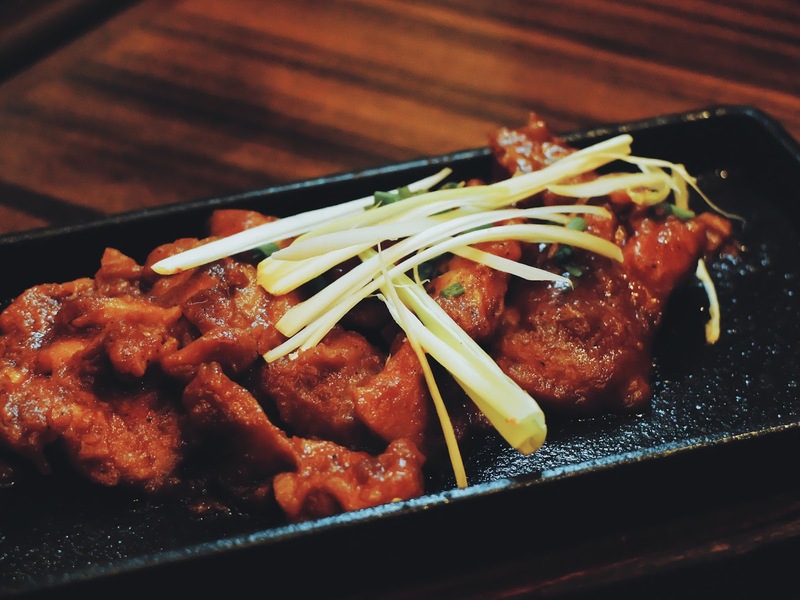 Grilled boneless chicken delicately marinated overnight in a secret spice sauce for that tangy taste. This was one of my favorites! The spiciness was just right for me and the meat was tender! 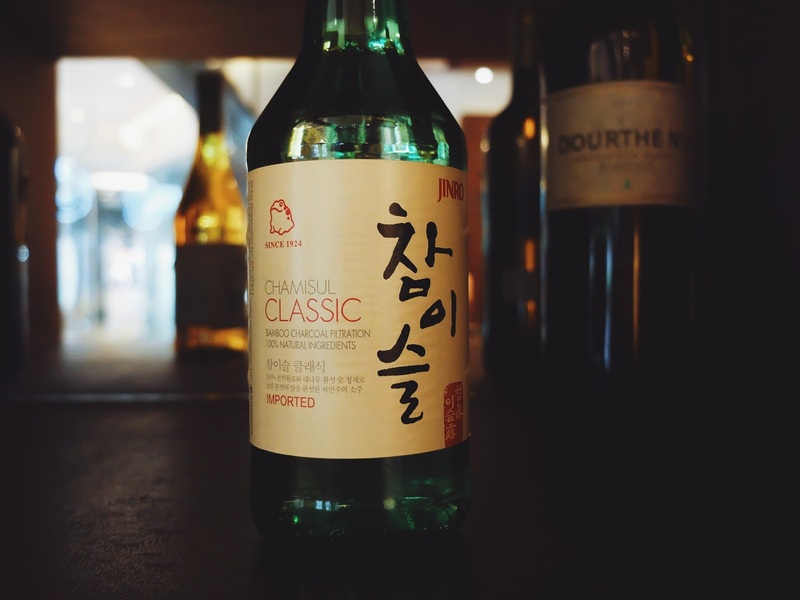 I found it more enjoyable when I partnered it with the Dolsot Bibimbap! Dolsot Bibimbap. 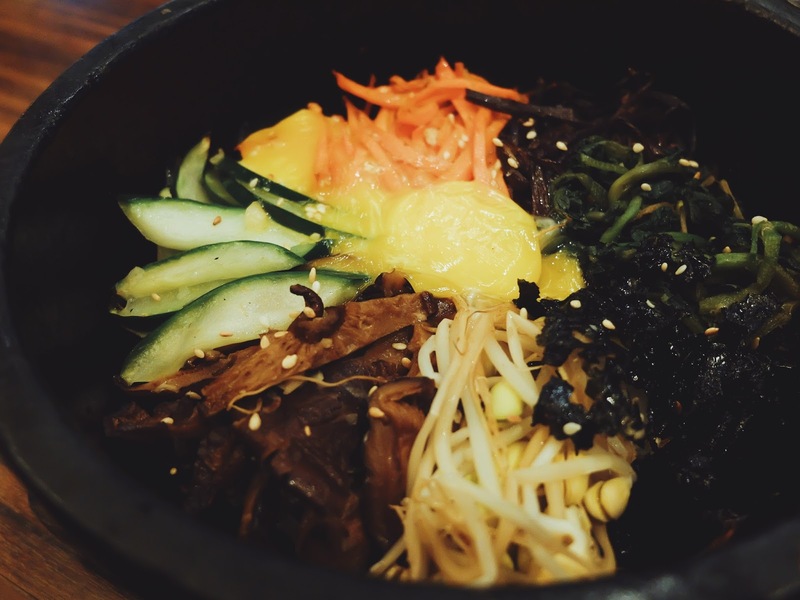 Bibimbap literally means "mixed rice." 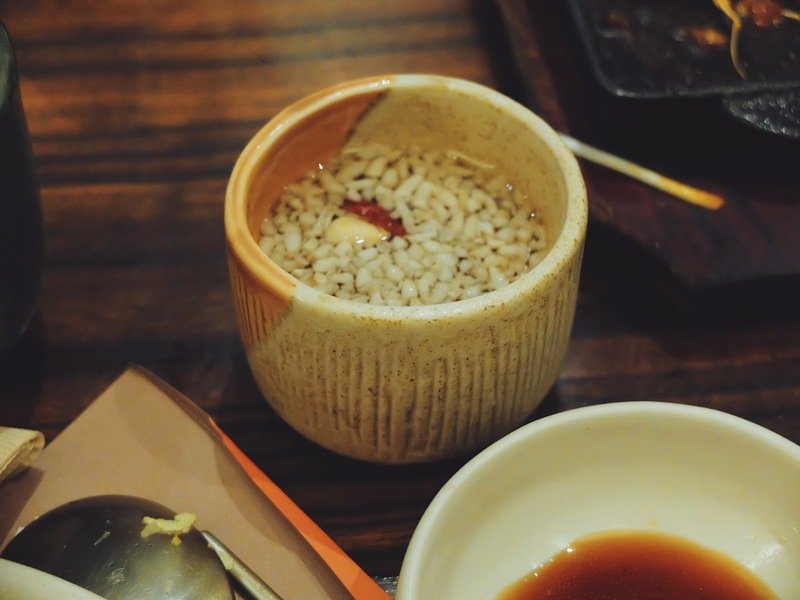 Sariwon's Dolsot Bibimbap is served piping hot in a sizzling stone pot. I'm not really a big fan of bibimbap, but this really worked well with the chicken! Yummm! It takes so little to make me happy and one of which are eating egg-based dishes. LOL. 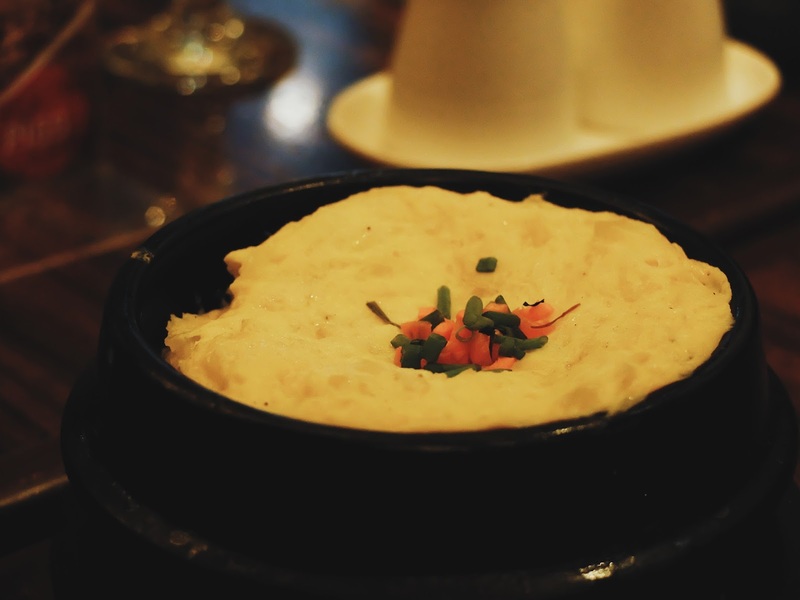 Just like the gyerran-jjim (steamed eggs that kinda looks like a souffle)! China (another foodie with us) recommended mixing a spoonful of this (or go crazy with it, whatever) to the doenjang chigae, and it actually works well together! 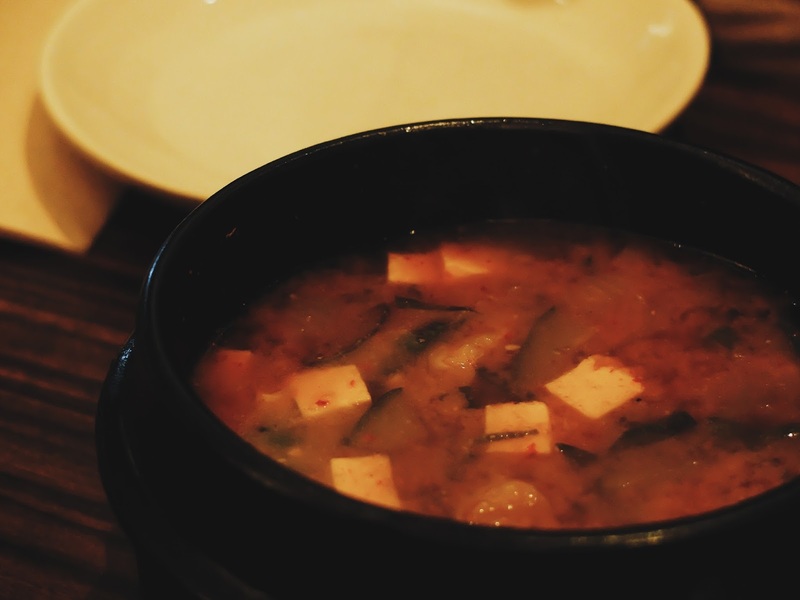 Doenjang Chigae. Delicious and spicy stew made with soybean paste, beef, tofu and vegetables. Haemul Pajeon. 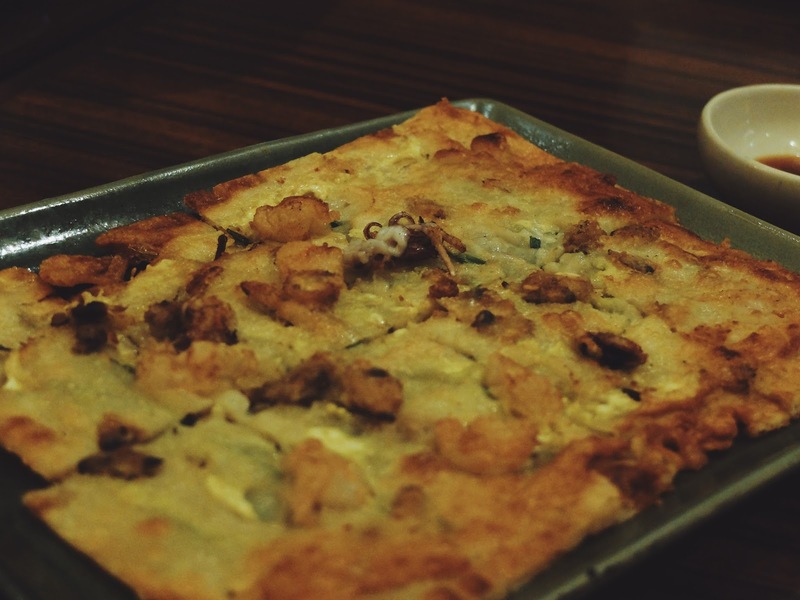 A traditional Korean pancake made with squid, shrimp, mussels and green onion. Sariwon's pajeon is certainly at the top of my list and I've eaten at quite a handful of Korean restos already. The thickness is perfect, there's plenty of seafood in it (definitely no scarcity of meat here! ), and it's got the perfect balance of crispy and fluffy as well. I really loved it. I'd come back to Sariwon just for this! Deungsim Yangnyeom Bulgogi. Honey-marinated slices of fresh USDA Choice beef, grilled with broth at the table. Served with freshly made sweet potato noodles. I actually brought a couple of my friends from work to Sariwon a few days after this event and had them try this bulgogi, too. Some of them commented that they found it too sweet. But I really liked the flavor of the broth! Even more the meat that was uber tender. Capping off our very sumptuous and filling meal was a Korean sweet rice and barley drink called Sikhye, which doubled as a sort of dessert as well. 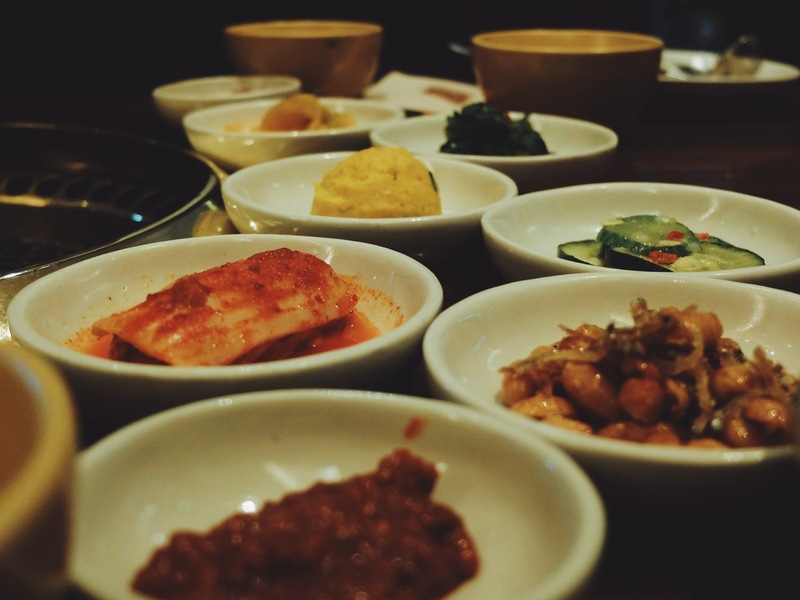 The Premium Galbisal Set is ideal for a group of 4 people, and boy, were we full at the end of this foodie meet-up (but I can't resist eating more pajeon because it was just too good)! I cannot stress enough how high quality the meats are! 👌👌👌 If you know someone wanting to try authentic Korean food, take them to Sariwon and I'm sure they won't be disappointed! 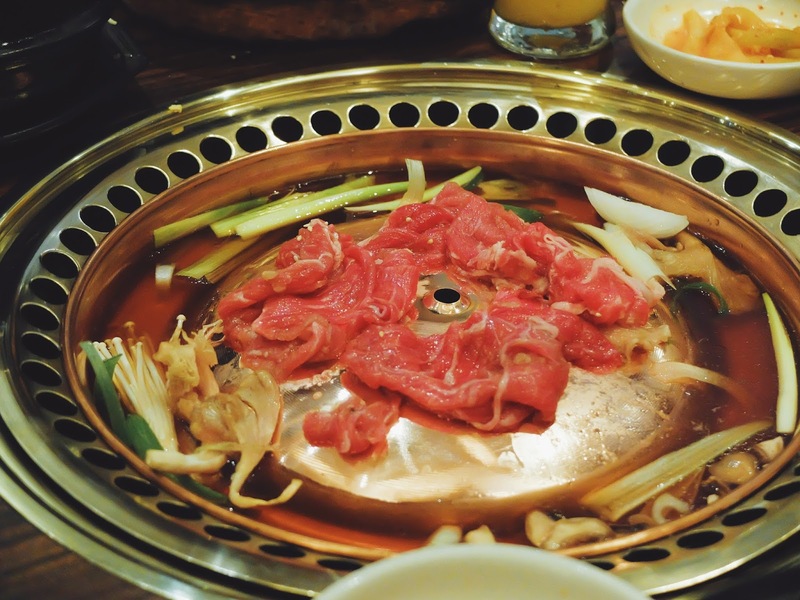 The restaurant's ambiance is very classy and traditional (perfect for all occasions -- meetings, celebrations with family or with friends), and I commend their staff for being attentive to our requests and assisting us in preparing the food (especially the grilling of the galbi and cooking of the bulgogi). They're also very knowledgeable about all the dishes! I'm a big K-drama fan and it was an added bonus when they started playing soundtracks to 🇰🇷 dramas!